Up till now we've just used Eagle to draw schematics and, in all honesty, it's not the world's greatest drawing tool. It only really comes into its own when used as it was intended, to assist the complete design process. 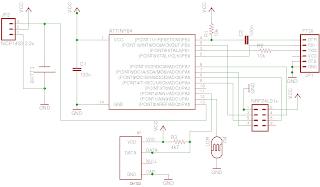 So, once a circuit has been designed and prototyped on breadboard/stripboard, its schematic drawn and checked for errors (using the ERC tool in Eagle), board layout can begin. Unsurprisingly this involves Eagle's "Switch to Board" menu item. A new window appears with a jumble of interconnected footprints corresponding to the components chosen in the schematic view. The board view is connected to the schematic so that any changes to the latter are reflected in the former. The first changes might be to replace some components by equivalents with different footprints, for instance (and Eagle provides a tool for just this purpose). However the main action of this view is layout, routing and manufacture. Layout must be done manually, by dragging individual components out of the jumble and into the white rectangle, representing the board itself. At this stage, I chose the board above (it's from Dangerous Prototypes) and deleted the white rectangle. A good rule of thumb is to place the largest parts first, although you'll probably have a good idea of the desired relative positions of the parts, having prototyped it already on stripboard. 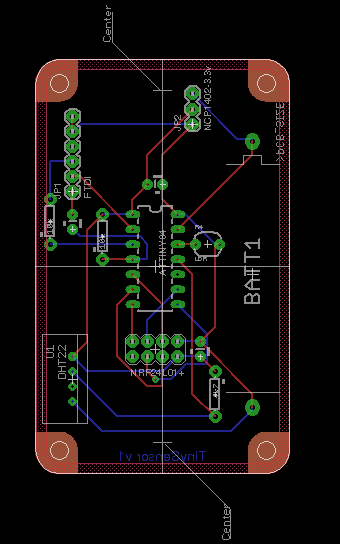 It's good practise to try manually routing the circuit, if only to be even more amazed at what a good job the autorouter does. The undo command is your friend here: I found it useful to try autorouting slightly different placements, undoing autorouting before moving components around. Once satisfied with the placement, print the layout on paper! This provides an essential sanity check of component footprints: use a pin for the drill holes and attempt to fit your chosen parts. Better to discover they don't fit at this stage than when the boards come back from the fabricator! The next step is to run a Design Rules' Check. This often requires a rules' file tailored to the fabrication process itself, in this case Seeed Studio's Fusion PCB Service. Download the rules' file, load it from the DRC dialog and run the check. This thread contains descriptions of some errors found at this point. A sanity-check widely recommended at this stage is to load up the layer-files above using a separate tool (e.g., gerbv) to see if there is a discrepancy between it and Eagle and correct it. Once this is done, upload the zip file, pay your money and wait! It uses my 'port' to ATtiny of Maniacbug's excellent RF24 and RF24Network libraries for the NRF24L01 radio. It runs for over a year on only a single AAA battery with an NCP1402 3.3v step-up converter. It is field-programmable using the TinySafeBoot bootloader and the Arduino IDE, as described previously. It costs about €15 per node when prototyped on padboard with breakout boards for the radio and voltage converter. RF24 and RF24Network tweaked for ATtiny and Raspberry Pi. 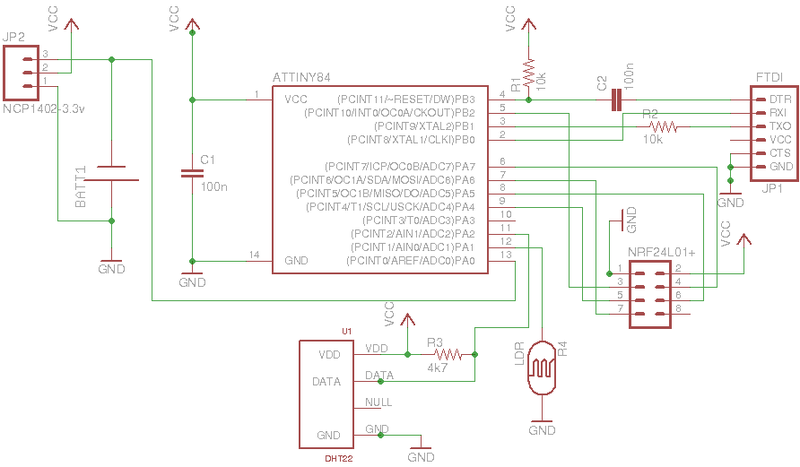 Modified Arduino SPI library providing SPI emulation on ATtiny. A DHT22 library (forked from here) and also tweaked for ATtiny, by removing floating-point. Sketches to test the board and set the network address (in EEPROM) and run the hardware in the field. A Raspberry Pi program to receive the data and dump it into the database.